Founded in 2009, Russian Rock trio GROTTOS is an instrumental band in the Blackgaze/Post-Black/Post-Rock/Progressive style of music. Following the release of two previous EPs, the band presents their debut full-length album here titled “Tethys,” which contains seven tracks. “Path” is the opening track, and the longest on the album. At first, we hear the full instrumental sound of Black Metal, but with connecting melodies. Just before the half way mark, the sound drops off a bit and it takes a deep breath before continuing on. In the final minutes, the “gaze” elements take over and you begin to feel through some of the dissonance. “Escape” is just under four minutes. Again, the sound is pretty bombastic and spirited, and the three instruments work well together in the rhythm. Surprises lay around each corner, and they keep you guessing as to where the progressions might lead. “All Rivers Against” opens with a bit of a mid-tempo groove. As the bass and drums swing in a heavy bottom end, the guitar dances mesmerizingly above, producing a hypnotic sound that entrances you. It lifts you to another place altogether…a place where you can taste colors and feel flavors. “Lines” is a five-minute swooner. Energetic and captivating, it uses unconventional connections to push a sound that is flowing and full of life. The interesting thing here about the title is that the song isn’t defined by arbitrary lines. In fact, it exists outside of musical boundaries and is just something you feel. Heavy and aggressive at times, it really hits you on a variety of levels. The title track, “Tethys,” is a short two minutes. A lush affair of landscapes, it is rich in texture and layers, with just simple guitar chords, because of the atmosphere swirling in the background. “Ash on Stones” is a five minute song that opens with a hardened sound. The drum toms roll as guitar and bass establish a slow and heavy grind. Even amidst the assault, peaks of melody build behind the accents. It slows to a halt at the end before a final fade out. “Leaves” is the five-minute closer. It’s a mid-tempo song that has some discord, as well as delicate melodies, and seems to ride the fence between what keeps you hopeful and what makes you feel dejected. The gravity of the song as whole seems to be the real key to the sound. Majestic and stalwart, it announces its being as existence, in an “I think, therefore I am” type of approach. 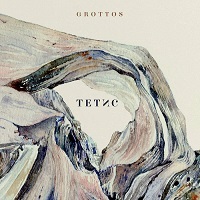 If you think you’ve heard it all when it comes to instrumental Post type music, you haven’t, because “Tethys” from GROTTOS have written some new pages. They work very well as a trio, and the music seems to be a reflection of them being able to read each other’s minds in the path of the compositions. In this regard they remind me of the Prog legends RUSH, though the music itself is of a different sound. Never too much discord, or aggressiveness, and also never too ethereal or delicate, they achieve a great balance on the album.